Besides the new Linux 3.1 kernel power regression, there's also a power regression introduced in the Linux 3.0 kernel that has previously not been talked about on Phoronix. 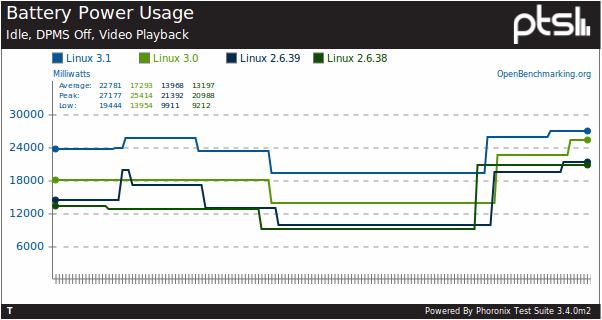 The Linux 3.0 power draw is up by 24% over the Linux 2.6.39 kernel. With all of these regressions, going from the Linux 2.6.38 to 3.1 kernel on an Intel Sandy Bridge notebook increases the power consumption by 76% under Ubuntu Linux and a dramatically shorter battery life. The notebook where this regression was spotted has an Intel Core i5 2520M quad-core Sandy Bridge CPU, Intel HD 3000 integrated graphics, 4GB of RAM, and 160GB Intel X-25 Extreme SSD. On the software side was the x86_64 Ubuntu 11.10 development snapshot as of 21 August with Unity 4.8.2, X.Org Server 1.10.3 RC2, xf86-video-intel 2.15.901, GCC 4.6.1, and an EXT4 file-system. The Linux 2.6.38, 2.6.39, 3.0, and 3.1 kernels were obtained from the Ubuntu mainline kernel repository. The Linux 3.1 kernel was a daily snapshot as of 21 August with a post-rc2 kernel. The Phoronix Test Suite was used for benchmarking the system on each kernel release in an automated manner, complete with battery polling. The Linux 2.6.38 kernel had an average power consumption of 13.2 Watts, Linux 2.6.39 was at 13.9 Watts, Linux 3.0 up to 17.3 Watts, and the Linux 3.1 kernel Git is now at 22.8 Watts. These are rather depressing numbers especially as the very latest kernel needs to be used if wishing to maximize the performance of the integrated Intel Sandy Bridge graphics. Here are the results on OpenBenchmarking.org.